Doha (VNA) – National Assembly Chairwoman Nguyen Thi Kim Ngan and Vice Chairwoman of the China National People’s Congress (NPC) Standing Committee Shen Yueyue pledged to promote bilateral parliamentary ties at their meeting in Doha, Qatar, on April 7 (local time). 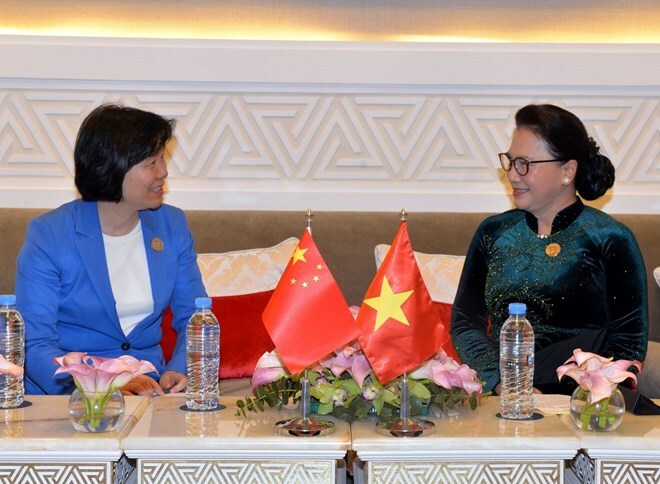 The Vietnamese top legislator expressed her pleasure to meet the Chinese parliamentary leader on the sidelines of the 140th Assembly of the Inter-Parliamentary Union (IPU-140) in Doha. She congratulated China on the successful organisation of the second session of the 13rd NPC in March, and wished the country success in realising the targets set by the session. Ngan also voiced her hope that the two countries will work together more closely to realise the common perceptions reached by their leaders and promote the sound bilateral relations in all fields from politics and external affairs to economy, trade and investment. The NA Chairwoman invited Chairman of the NPC Standing Committee Li Zhanshu and Vice Chairwoman Shen Yueyue to pay an official visit to Vietnam in the time to come. NPC Vice Chairwoman Shen Yueyue praised the Vietnamese NA Chairwoman’s speech at the IPU-140. She shared the view that Vietnam and China should further promote the bilateral comprehensive strategic cooperative partnership in the current global context. According to Shen Yueyue, Party General Secretary and President Xi Jinping selected Vietnam as the first country to visit after the 19th National Congress of the Communist Party of China, and the visit has contributed to opening up a new chapter in the two countries’ relations. She noted the resolve of leaders of both countries to continue implementing the agreements reached by their leaders and legislative bodies, creating a foundation for stronger bilateral cooperation in the future. The NPC Vice Chairwoman suggested the NPC and the Vietnamese NA diversify their cooperative ties, while continuing to promote the role of parliamentary cooperation in all areas.